Katherine Underwood reports from Durham, N.H., where controversy is stirring over what can and what can't be displayed during the holiday season. 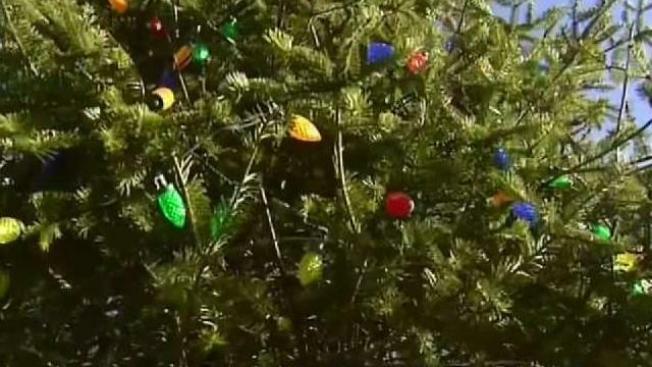 Some New Hampshire residents are calling for the end of a longstanding tree lighting tradition in one seacoast town after the town administrator refused to allow the local Jewish center to install a menorah next to the tree. The lighting of the Memorial Park tree has been a beloved holiday tradition for as long as most Durham residents can remember. “We had residents who grew up with it and are now bringing their kids and grandkids to it, so it’s a special event,” said Town Administrator Todd Selig. This year, the Seacoast Chabad asked to install a nine-foot menorah next to the tree. Selig said that request was rejected. “Our longstanding policy has been, we simply don’t allow the display of religious items on town property,” he explained. The town’s “holiday tree” is exempt from that policy because Selig says according to a Supreme Court ruling, a “holiday tree” is secular. The problem here is that not everyone agrees. “I feel like the tree is religious, so the menorah should be allowed there too,” said UNH Junior Andrew Merchant. Still, Selig stands by his decision, saying there’s another important public safety concern with placing giant removable object, religious or not, in the center of a college town. “We ensure all of our infrastructure downtown is hardened and securely fastened to the ground; if it’s not, it tends to walk away by intoxicated people,” Selig said. And in that respect, even students understand the decision. “Being in a college town, everything is up for grabs if you’ve had a little too much to drink at night,” said UNH Graduate Lauren Bannon. “There are some stupid kids out there, especially when they drink, so that’s understandable,” Merchant said. Rabbi Berel Slavaticki, who made the request, says the Seacoast Chabad would be paying for the menorah and they aren’t afraid of possible damage to it. “What a shame it would be to allow anti-Semitism and vandals to chase us away, instead we have to show our faith proudly,” Rabbi Slavaticki said. He also made it clear that he believes this is just the first step toward a more inclusive holiday season in Durham. “We are committed to working with the town administration to create a path forward that will allow everyone to enjoy their faith,” Rabbi Slavaticki said. After a special meeting Monday night, the town decided not to cancel the tree lighting ceremony next year. Instead, there will be a committee formed at the beginning of the year to look into making the festivities more inclusive.